Ahh, I'm back! It was nice to get away this weekend, but I must admit that I'm happy to sleep in my own bed again. It's funny how we forget just how comfy our lives really are. Our homes are custom-made havens. One thing I brought back from my trip is a nasty sunburn. Apparently 2 coats of sunblock is no match for 5 hours on the lake. 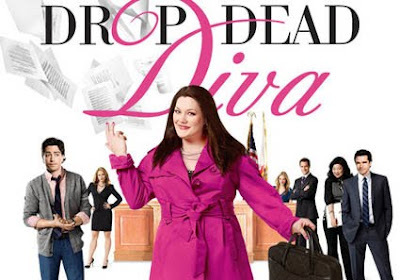 Since I can barely move, I've spent pretty much the entire day slathered in aloe and watching my newest guilty pleasure: Drop Dead Diva! My boyfriend wants no part in my addiction to the skinny model in a fat lawyer's body, but what do you think? Have you seen the show? I absolutely adore this show!! I think that Jane is such a doll- someone I would want as a real-life friend, for sure! Love the show. I thought Cybil Shepard's character was hysterical this week!!! I LOVE, LOVE, LOVE this show!